The Oil Games was meant to be a contest of champions -- twelve face oils duking it out for the grand title of Best Oil. I have to admit the showdown didn't end up having the effect I anticipated, and my hoarding has officially reached next level. Remember my collection of oils I shared with you the other day? It has grown to nearly double the original amount from my initial showdown! 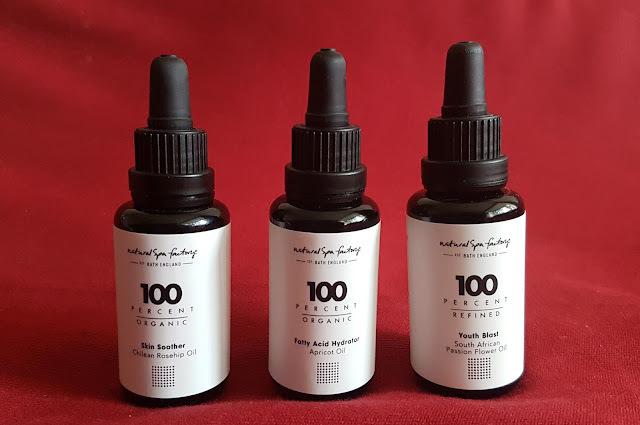 And my love of facial oils must be spreading like wildfire, as I had three bottles from Natural Spa Factory's range arrive at my door last week! 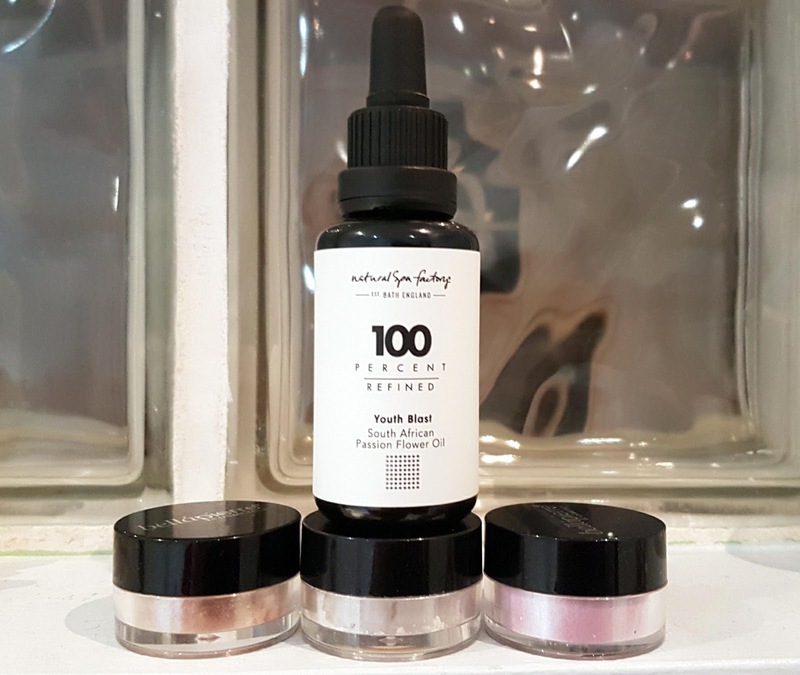 Natural Spa Factory is a brand from Bath that focuses on creating luxurious botanical-based products free from parabens, SLS, MCI and methylisothiazolinone. NSF carries a wide range of items, from scrubs and shampoos to massage candles and body wraps, but my favourite (as you might have guessed!) has to be their 100 Percent Oils collection. There are five oils to choose from - rosehip, jojoba, passion seed flower, apricot, and baobab - and all of them are cold-pressed, organic, and packed full of beneficial nutrients. Right up my alley! I have been trying out Natural Spa Factory's Rosehip Oil, Apricot Oil, and Passion Seed Flower Oil, and I have been thrilled with the results so far. 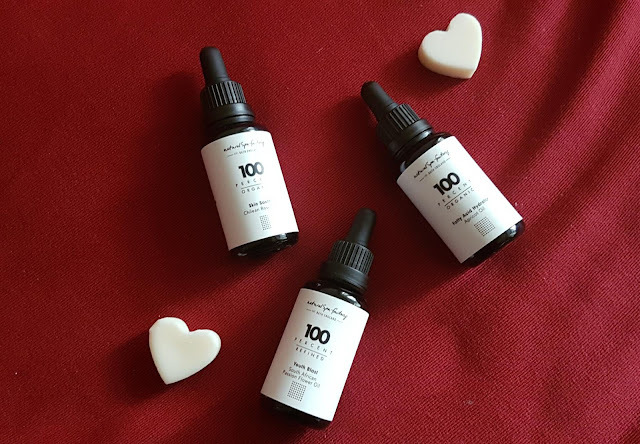 Each of these oils works great for my skin type (combination, with hormonal blemishes and occasional dry patches), and is great value for the quality and the size of the bottle. Plus, two of these oils are kinds I have not seen around many places, so I was excited to expand my knowledge of carrier oils even further. I have talked loads in the past about the benefits of rosehip oil, as I find it truly is my miracle oil. Not only is it packed with fatty acids, but it contains b-carotene and vitamins e, c, d, and f, all of which are great for balancing the skin and keeping the cells working effectively. Natural Spa Factory's is a lovely amber/ruby colour, and is so smooth -- it's seriously the definition of skin food. And their Apricot Oil and Passion Seed Flower Oil are no different! The apricot kernel oil is ideal for dry or sensitive skin, and is high in linoleic acid which helps maintain ideal moisture levels. It is also high in oleic acid which is great for soothing irritated skin and packing an intense hydration punch. NSF's Passion Seed Flower Oil is less intense than the apricot oil, and is geared towards youthful skin that does not need a heavy product. This might be my favourite find in ages, as I find many skincare products are aimed at more mature skin and tend to clog my pores, so having a "Youth Blast" is refreshing! Now, most people don't have a collection of 20+ facial oils, so using the oil as intended is probably what the majority opt for. But I have started worrying about how in the world I am going to use over 500ml of oil before it expires, so I decided to get a bit crafty. With Valentine's Day just around the corner, I figured what better way to start my experiments than with some natural and organic beauty hacks for kissable lips, dewy skin, and a pre-champagne purifying mask! It took a few tries to get the ratios and textures right for my DIY beauty products, but it was so fun playing around with Natural Spa Factory's oils and my stock of natural skincare bases. I have been getting more and more into aromatherapy, so I loved being able to try my hand at creating products! All of these recipes can be changed so they cater to your own skin type, and you can substitute different scents to suit your needs -- is there anything better than having the perfect product suited exactly to your wishes?? 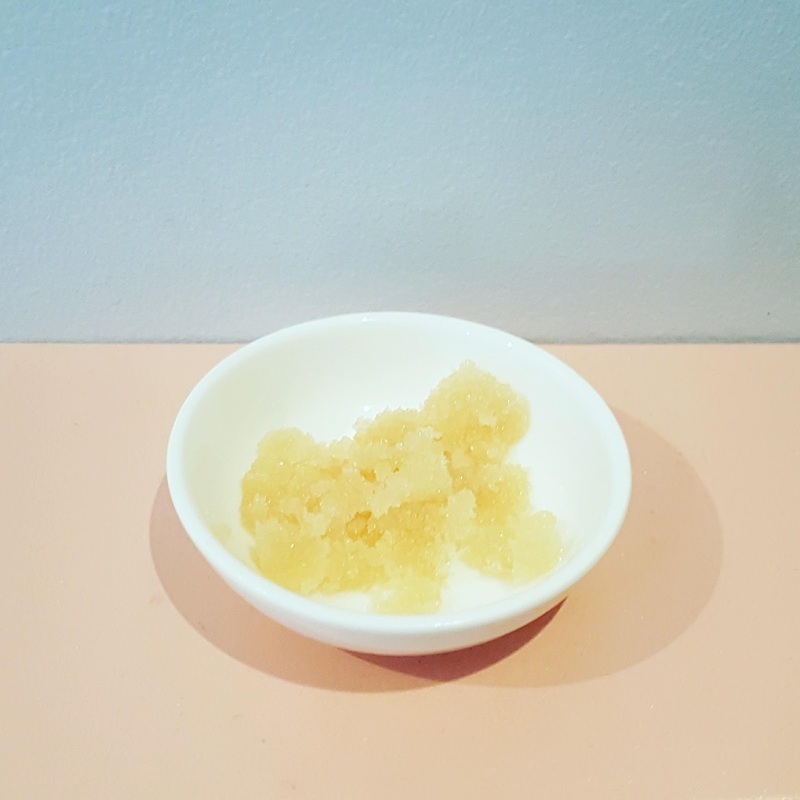 This four ingredient lip scrub took me less than five minutes to make, and worked just as well (if not better) than the store bought ones I have tried in the past. Plus, if you have the ingredients on hand already, it does not cost a thing! Fresh lips for free? This couldn't sound better! Basically all you need to do is blend 2 teaspoons of solid coconut oil with 1 teaspoon of brown sugar, three to four drops of rosehip oil, and one to two drops of peppermint oil. Be sure to thoroughly blend all the ingredients, as the essential oil needs to be worked into the carrier oils so it doesn't cause any sensitivity to your skin. For extra hydration, try adding in a second oil -- the passion seed flower oil would be great for this as the scent is not too overpowering. And, if you want a hint of chocolate to make your lips extra tempting, mix in half a teaspoon of chocolate flakes! This makes for a fantastic chocolate chip lip scrub that is too tempting not to try. Before starting to mix in additional ingredients, you want to get the clay wet and near the right consistency for application. You can use water or hydrosol for this -- I do a mix of both as I find this adds an extra boost to the mask. Depending on how thin you want the clay (the thicker it is the longer it takes to dry! ), you will add between three and four tablespoons of water to one heaped tablespoon of clay. I did find I ended up with a fair amount extra when I used these ratios, but I used the extra on my partner for some added fun -- seeing his face covered in mud was a right treat! As I usually find clay masks drying, I added five drops overall of the apricot and passion-seed flower oil (so 2-3 drops of each) to my DIY. This made my face feel so much less tight, and I could feel the added benefit of the hydration boost from start to finish. 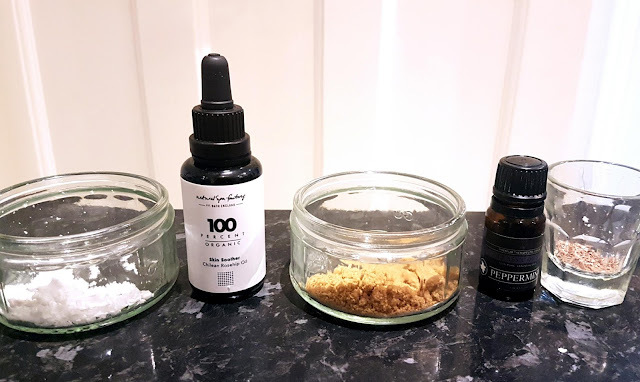 And for the essential oils, I only used a single drop of each -- remember that essential oils are super concentrated and less is more when it comes to skincare! Be sure to mix thoroughly before applying, and let the mask sit for about fifteen minutes before washing off. 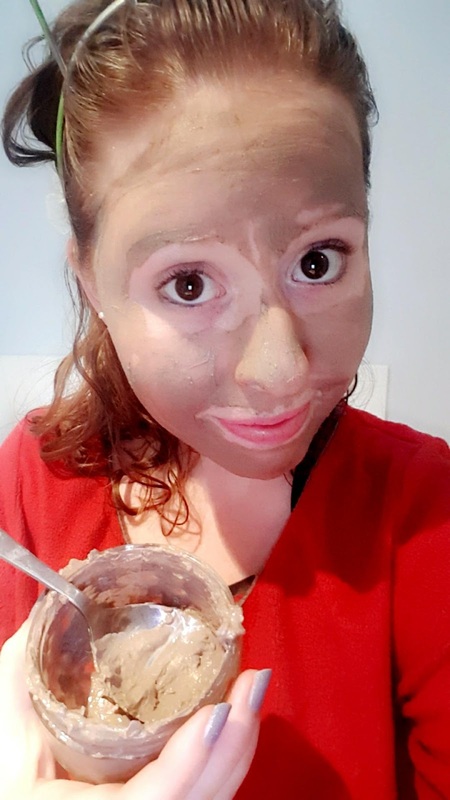 This gives enough time for the clay to absorb all the nasties from your face and the oils to sink in and provide the healthy benefits you are looking for! We have all seen those 'natural glow' products that help give the appearance of healthy, radiant skin, but have you checked what is in most of them? While I have to admit I am pretty pasty and could do with some extra colour, I would rather be stuck as Snow White than pile chemicals on my face. This beauty hack brings the best of both worlds though -- you can get the glow that gives you a dewy, fresh faced highlight AND stay toxin free. 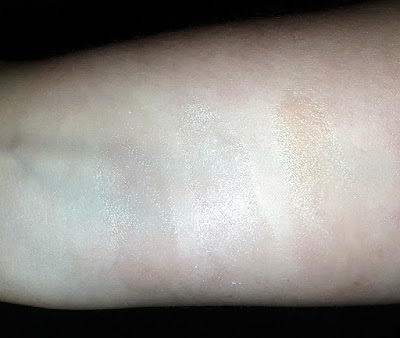 All you need to do is take a shimmer eyeshadow and add a tiny amount (and I mean TINY) to the tip of your finger. Loose powder is easiest, but you can use the fallout from pressed shadow as well. Then, simply take a single drop of your face oil and thoroughly mix with the shadow. And voila -- instant highlighting drops! I love using this when I don't want a strong highlight but still want a subtle shine, plus find it so fun experimenting with the shades! I love that I have found new uses for my oils, and won't stop the DIYs here -- I will be playing with some hair mask recipes and even some body butters in the next few months, as I love the freedom making my own products gives me. Let me know if you try these Valentine's hacks, or if you have any of your own to add. I am always looking for new ideas to try, and anything that helps keep us healthy and hydrated is worth sharing! And if you would like to try Natural Spa Factory's 100 Percent Pure face oils, head on over to their website -- they have an option for every skin type, so it's well worth checking out! Plus, you can score 5% off your first order by signing up for their newsletter. Good skin and great bargains? Count me in! I love the sound of the lip scrub - I make a really similar facial scrub myself with almond oil and it does wonders for my eczema! I have never made my own beauty products before, but would like to give the face mask a try! These are some great recipes. I have made a lip scrub before and upped the amounts to create a handscrub too. I look forward to attempting to make a face mask soon. I'll have to try a handscrub next! I think the apricot oil would be great for that as it's so hydrating :) let me know how your face mask turns out! Great work in turning those oils into something more useful. I have to bookmark this so I can refer back when I make my own version. I’ve always been bad with incorporating a skin care regime. I do love the idea of making your own face mask with the addition of apricot and passion seed. I have never tried that face mask looks so wonderful in skin. I should start doing this.